There are so many more options these days when it comes to finding accommodation for a little getaway. No longer are we confined to bland hotel rooms or twee B&B's, but we can opt for beautifully decorated and styled properties that will put you right at home, and will probably give you some inspiration for your own home too. I recently came across this fantastic little cottage on Unique Home Stays website that I felt I had to share with you. The cottage, called Filly Island is based in the Cotswolds, not far from Cirencester, and was originally a storeroom for the neighbouring mill. It's a compact one bedroom cottage, but it is packed full of vintage character and upcycling ideas. This kitchen has totally stolen my heart! 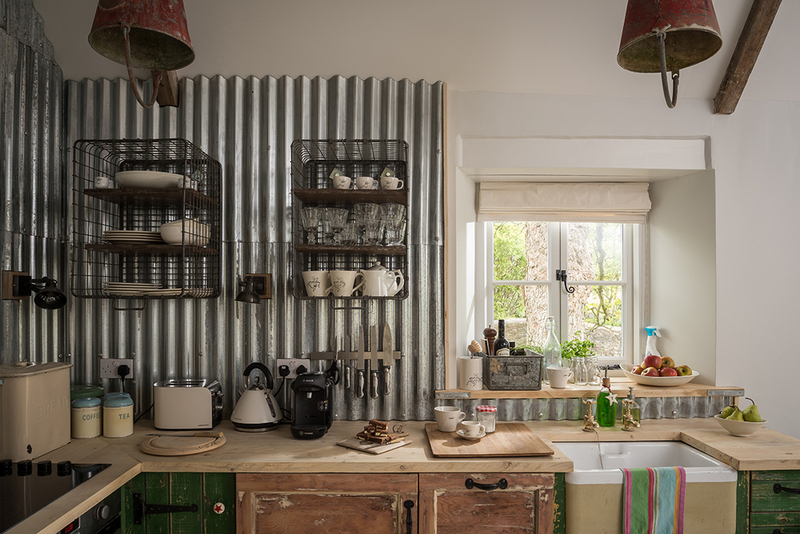 The corrugated tin wall is a bold move, but I love how it looks here. What do you think? The sink in the bathroom is also a favourite and I LOVE LOVE LOVE the sliding door between the bedroom and bathroom! Such a great space saver idea, but still looks fabulous. Oh and check out the bed headboard, I'm definitely planning something like this in our new house. The outside is equally as beautiful and the living room opens out into the patio. I can just imagine snuggling on that sofa with a good book and glimpsing up at the pretty view every now and then!